FMWLibrary is one of more than 5,000 organizations on LibraryThing. 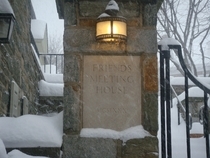 About meFriends Meeting of Washington (FMW) is a large, urban community of Quakers and non-Quakers. Our Meeting House, where we worship together, is located on Florida Avenue near Dupont Circle in Washington, DC. About my libraryThe Library consists of books relating to Quakerism, spirituality, and peace studies.